05.12.2016: Newsletter ECN volume 10, number 3 (issue 25) published! Download from this page. 23.-24.11.2016: Third CIPRNet Master Class took place in Sankt Augustin. 10.-12.10.2016: CRITIS 2016 took place in Paris, France. 12.07.2016: The recorded CIPRNet Open Modelling Interface (OpenMI) is a modelling standard emerged from the domain of water system simulation. 21.04.2016: CIPRNet Open Modelling Interface (OpenMI) is a modelling standard emerged from the domain of water system simulation. [Click for more information]OpenMI-Webinar. Read More. 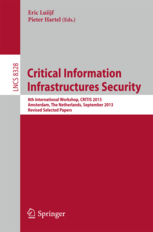 01.03.2016: The Call for Papers for CRITIS 2016 has been launched. 20.02.2016: CIPRNet Lecture on Avoid enlarging a disaster: take care of The European Council Directive 2008/114/EC defines: ‘Critical infrastructure’ (CI) means an asset, system or part thereof located in Member States which is essential for the maintenance of vital societal functions, health, safety, security, economic..
16.02.2016: CIPRNet Lecture on Cyber-physical security solutions for Critical infrastructure protection (CIP) is the study, design and implemen-tation of measures (pro-action, prevention, preparation, incident response, recovery) aimed to reduce the risk that critical infrastructure fails with serious consequences and..
[Click for more information]CIP currently receives more than 1,300 page views per day! 27.01.2016: The second CIPRNet review took place in Sankt Augustin, Germany. 11-13.11.2015: Second CIPRNet Master Class on Modelling denotes the action of designing and creating a conceptual model or a computational model or a CI model or a computer simulation. Other synonyms may apply as well. 08.10.2015: CRITIS 2015 took place in Berlin, Germany. It attracted 73 participants. For the second time, the organisers bestowed the CIPRNet Young CRITIS Award (CYCA) for awarding the best scientific paper on CIP/CIR by young researchers below the age of 36. Next year's CRITIS 2016 will be held in Paris between October 10-12. 22.01.2015: The Call for Papers for CRITIS 2015 has been launched. 27.11.2014: CIPRNet lecture on Power grids, smart grids and complex networks by Dr Antonio Scala will be held at UCBM in Rome on Dec 3, 2014. CIPRNet lecture on Dynamic Functional Modelling denotes the action of designing and creating a conceptual model or a computational model or a CI model or a computer simulation. Other synonyms may apply as well. [Click for more information]vulnerability and interdependencies of Critical Infrastructures (DMCI) by Prof Paolo Trucco will be held at ENEA in Rome on January 20, 2015, 10.30 h.
07.11.2014: Open Modelling Interface (OpenMI) is a modelling standard emerged from the domain of water system simulation. [Click for more information]OpenMI Symposium held in Delft. Read More. 17.10.2014: CRITIS 2014 concluded. Final programme can be found here. 16.10.2014: First CIPRNet Young CRITIS Award (CYCA) bestowed. The winner is Constantinos Heracleos. Awarded finalists are Federica Inderst and Stavros Ntalampiras. Details forthcoming on this page. 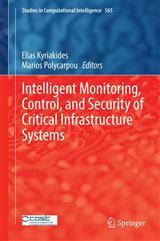 15.10.2014: New book edited by E. Kyriakides and M. Polycarpou now available: Intelligent Monitoring, Control, and Security of Critical Infrastructure Systems. 08.10.2014: Announcement of the Open Modelling Interface (OpenMI) is a modelling standard emerged from the domain of water system simulation. [Click for more information]OpenMI cooperation meeting on 31st October in Delft. Open Modelling Interface (OpenMI) is a modelling standard emerged from the domain of water system simulation. [Click for more information]OpenMI is the Open Modelling denotes the action of designing and creating a conceptual model or a computational model or a CI model or a computer simulation. Other synonyms may apply as well. [Click for more information]Modelling Interface, a software A (network) component is an object in a CI model e.g. a generator, a pump, a transmission line, a physical transport, a node, a substation. Components have attributes and user-specified behaviour. [Click for more information]component interface definition which allows interactive coupling of simulations. Click here to register. 21.08.2014:Registration to CRITIS 2014 is open. 25.04.2014: First CIPRNet Master Class on Modelling denotes the action of designing and creating a conceptual model or a computational model or a CI model or a computer simulation. Other synonyms may apply as well. [Click for more information]Simulation and Analysis for Critical Infrastructures has been conducted in Paris, France at UIC headquarters, attracting 40 participants. 16.04.2014: CIPRNet web site now contains an integrated glossary function of technical terms and definitions. Click on an underlined term, like The European Council Directive 2008/114/EC defines: ‘Critical infrastructure’ (CI) means an asset, system or part thereof located in Member States which is essential for the maintenance of vital societal functions, health, safety, security, economic..
[Click for more information]Critical Infrastructure, and get a definition. [Click for more information]CIP community. CIPRNet partners JRC and Fraunhofer will be announcing CIPedia© shortly. [Click for more information]CIP related research projects published. 27.03.2014:2014 call of the CIPRNet Young CRITIS Award for the best young researcher's paper in Critical infrastructure protection (CIP) is the study, design and implemen-tation of measures (pro-action, prevention, preparation, incident response, recovery) aimed to reduce the risk that critical infrastructure fails with serious consequences and..
[Click for more information]Critical Infrastructure Protection is published! 27.02.2014:Registration for Master Class of Modelling denotes the action of designing and creating a conceptual model or a computational model or a CI model or a computer simulation. Other synonyms may apply as well. 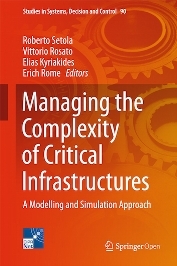 [Click for more information]Simulation and Analysis of Critical Infrastructures (24th and 25th of April, 2014, Paris, France) is opened. 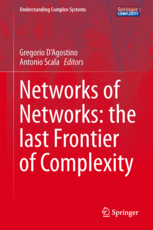 29.01.2014: Book Networks of Networks: The Last Frontier of Complexity published. 18.09.2013: CRITIS 2013 concluded. Final programme can be found here. 15.07.2013: Registration for CRITIS 2013 opened! For enquiries on publications, press and dissemination material, please contact Elias Kyriakides.